But it’s usually not long before the sun’s glorious rays heat up the workplace to unbearable levels. 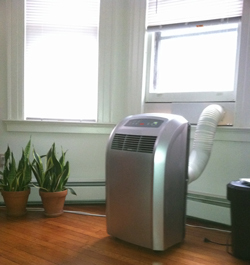 The heat comes streaming in through your windows – but can’t get out again. And on top of this the glare at this time of year can be directly into your eyes and onto your PC screen. 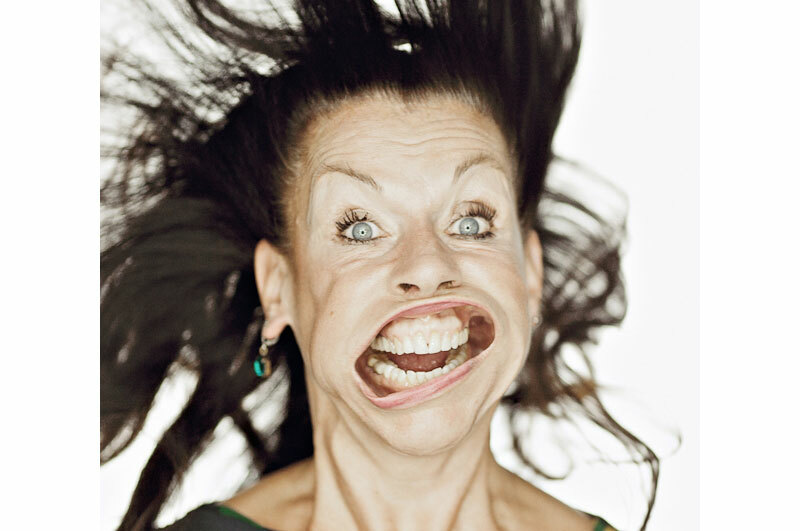 “AHH!” I hear you say – Air Con – that’s what you need. But is it? There is a big financial drawback – along with physical and cosmetic issues with this approach. 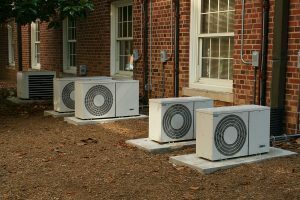 Even a small-scale installation of AirCon can cost a packet. And then there’s the cost of running it – not very Eco-friendly. Some times pretty noisy too. But is the expense, noise, and effort really worth it? Portable air conditioning is available. Cheaper. No installation needed. But it’s awkward to position, doesn’t really give an even flow across the entire workplace, and the noise can make telephone calls and impromtu meetings pointless. And where do you keep the big ugly box the rest of the year? Or do you leave it lurking in the corner like some weird piece of objet d’art? You can use blinds of course. Ok, so you’ve a swish, elegant, modern open plan office which has huge windows pride of place – and now you need to cover them all up! You have all those lovely windows and fantastic view – but have to keep the blinds pulled right down in order to bear being in at work at all. Blinds (or curtains) can be a great addition and add a nice finishing touch. But getting it right is not always easy, or cheap or even that effective. And of course if you opt for fine or coloured fabrics they will likely get quickly damaged and faded from the strength of the sun. Sometimes even blinds don’t stop the heat. You may have to open some windows for ventilation (and with many modern buildings this is not an option at all). It’s a pretty blunt way of dealing with the problem though. Venetian blinds end up getting blown all over the place with the slightest breath of wind – and yet the room can still be stuffy and hot – and in the shade! Seriously? Fans? 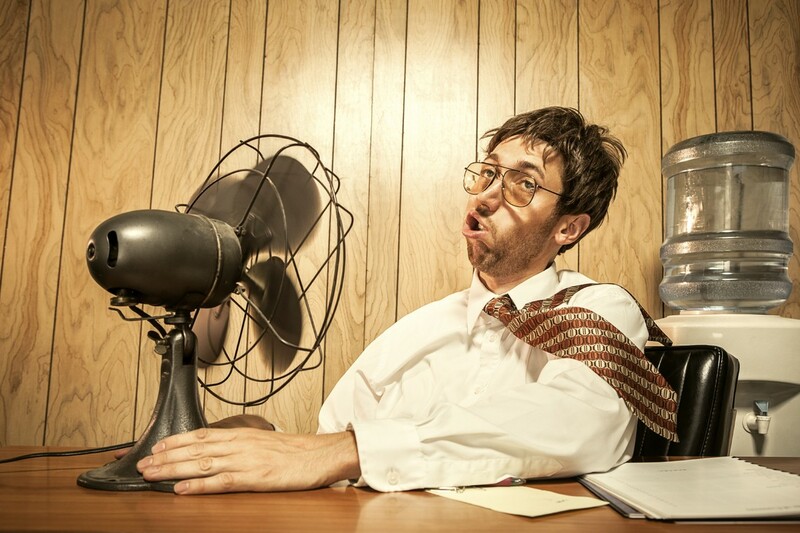 You’re a top-notch business with amazing staff and great offices – and the best fix for your heat problem is a fan….? 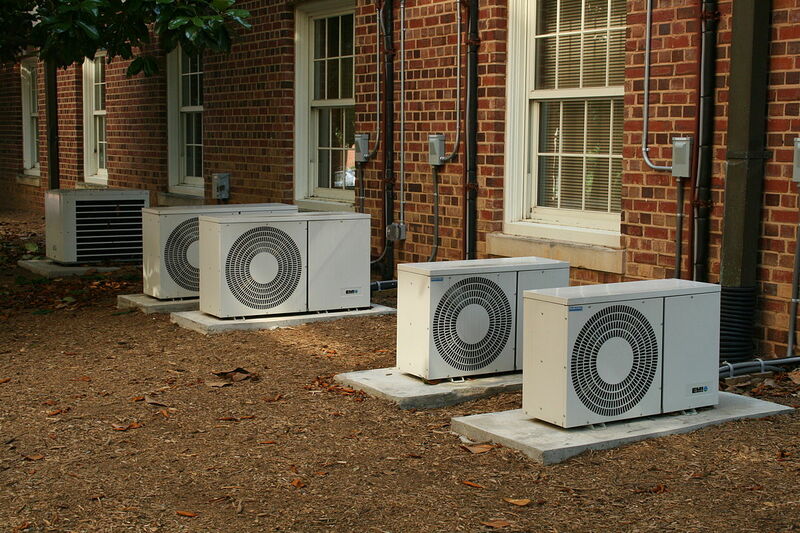 But they’re more about moving the existing air about than cooling it down per se. And of course the hotter it is the stronger setting you need on the fan. So you could end up facing a force 10 gale whilst trying to read through that report. 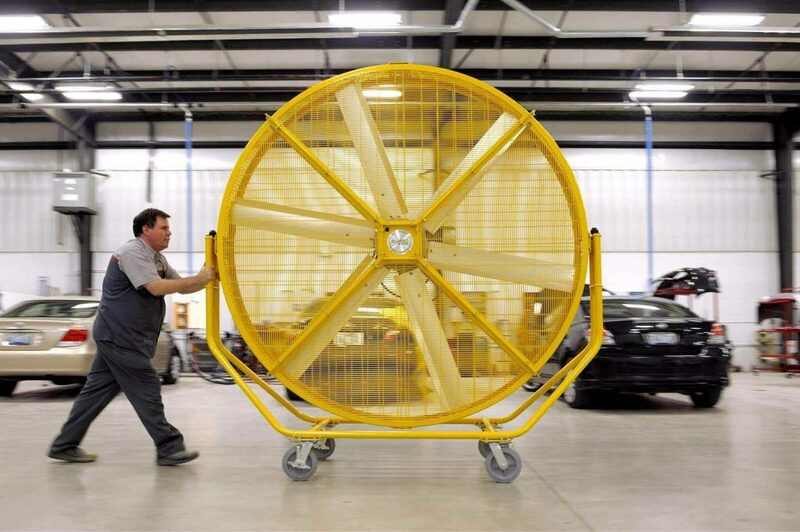 It’s fair to say that – although they have their uses – we are not big fans of fans. Blown out of proportion. We are not big fans of big fans. Now you’re talking. 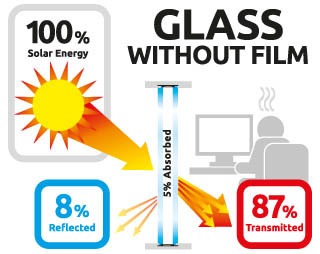 With this solution you can not only cut out the heat by up to 70% – but also reduce the glare. And it’s relatively economical to install, with less disruption or downtime for your business and has minimal impact on the workplace than AirCon. Hi-Tech Window Film, professionally installed, prevents the transference of heat through your glass so stops rooms heating up in the first place. You don’t need to cool it down – it’s pleasant enough already! No need to open the windows, or pull the blinds, or fill the office with fans. You can use the room perfectly as intended. And its not just the spring and summer months that benefit. Window film can help to insulate too. 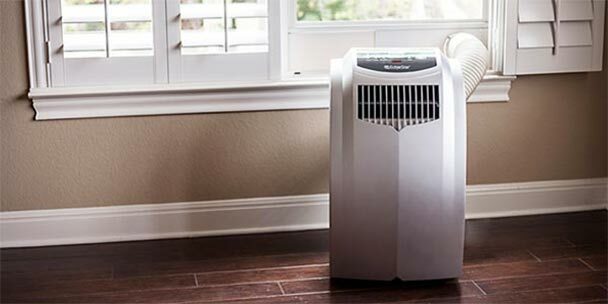 Just as the sun’s heat is kept outside – the heat that is in the room stays in – meaning no cold spots or chilly seats by the window – and you may even save on heating costs. Ooh – this look nice. No Blinds. No Curtains. No fans. No AirCon. Basically when it comes to keeping cool in school, or the warehouse, hospital, factory, or office – window film is head and shoulders above the competition. 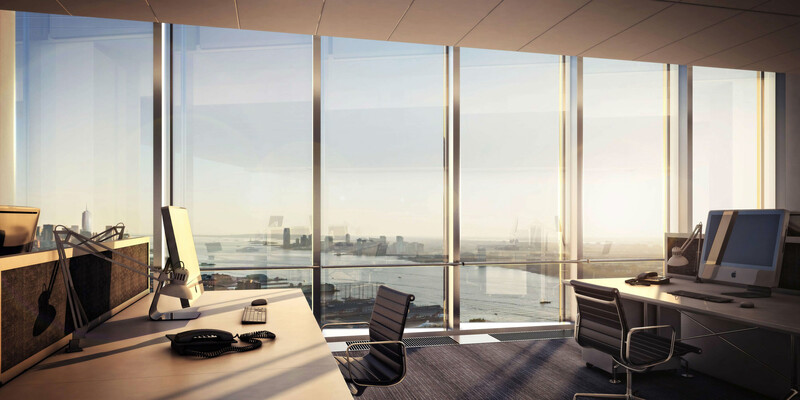 There’s not much we don’t know about solar control window film – or pretty much any issues that affect glass in the workplace.